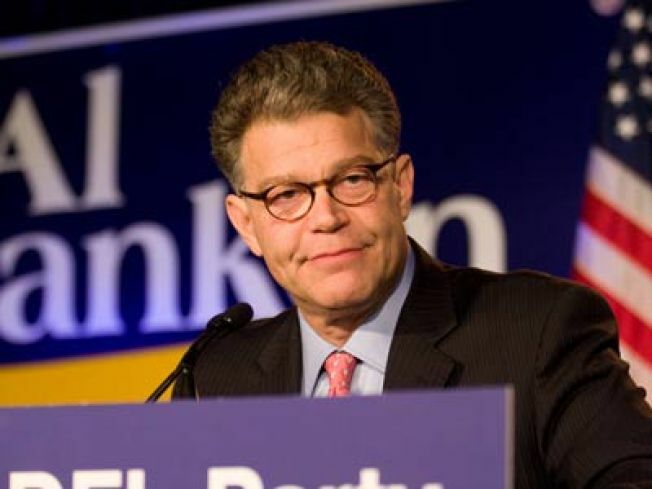 Al Franken now leads Norm Coleman in the Minnesota race. That means we're this much closer to have a honest-to-goodness comedian in the U.S.Senate, a legislative body that only seems to be populated by jokers. Al Franken leads in the Minnesota Senate race for the first time, after a week in which the state’s Canvassing Board reviewed more than 1,300 disputed ballots. Franken’s lead over Coleman grew to 252 votes Friday, according to the Minneapolis Star-Tribune’s unofficial tally. Coleman led Franken by 215 votes on Election Night, and held a 188-vote lead before the board began reviewing the challenged ballots. The updated count doesn’t include the thousands of challenges that were withdrawn by both campaigns — ballots which could change the results yet again. Franken withdrew more challenges than Coleman, which would net Coleman votes when they’re added to the count on Monday. Franken’s campaign, however, is optimistic that it will hold the lead when all the votes are counted. So far, it has had more success with its challenges: Coleman added only 36 votes after his 852 challenges (4 percent success rate), while Franken gained 70 votes from his 469 challenges (15 percent success rate). The Star-Tribune is projecting Franken will hold a 75-vote lead over Coleman when all the disputed ballots are counted. But the timeline for certifying a winner is as distant as ever. With more litigation pending and additional absentee ballots still to be counted, the race will not be decided before the end of the year. Jim Manley, a spokesman for Senate Majority Leader Harry Reid, said he doesn’t think the governor has the authority to appoint a temporary placeholder until the Senate declares the seat vacant. “There is no reason why we can’t just wait until there is certification by the state to seat somebody,” Manley said. The Coleman campaign today also filed a new lawsuit with the state Supreme Court to prevent the state Canvassing Board from certifying its count until it decides how to handle duplicate ballots. Coleman’s campaign is alleging that as many as 150 ballots were accidentally counted twice during the recount process. While the Coleman campaign doesn’t have evidence that votes were counted twice, it points to precincts where the number of recounted votes was larger than the original Election Night number. The Canvassing Board ruled Friday morning that they don’t have jurisdiction to handle the decision. Franken campaign spokesman Andy Barr said the lawsuit shows that the Coleman’s campaign is “panicked” that it will end up behind once the recount is completed. “Now that they realize they are going to lose, they are once again running to court to try to change the rules and disenfranchise hundreds of voters based on a theory they invented and cannot support with any real evidence,” said Barr. The outcome of the recount also depends on about 1,600 improperly rejected absentee ballots that have yet to be counted. The state Supreme Court ruled Thursday that the ballots must be included in the final count, and that both campaigns need to agree on a uniform standard for sorting and counting the ballots. Once they’re counted, the absentee ballots are expected to benefit Franken because absentee voters tend to skew in the Democrats’ favor in Minnesota. Both campaigns privately expect further litigation, even after the vote is certified. Coleman’s campaign already has disputed the Canvassing Board’s decision to include 133 ballots in the recount that appear to have gone missing from a heavily Democratic Minneapolis precinct.